I am so glad Halloween is over with. I have to say this was one of my worst ones ever and it had nothing to do with the crazy snowstorm this past weekend. Well I guess it does in someways since if we didn't get the snowstorm Steve would have been home to help during my minor crisis. Since he was working, I had to call two neighbors to come over and help. Our little kitten escaped while I questioned teenagers on what they were dressed as besides just teenagers. Their response was "Strangers". It amazes me how many people come from the neighboring city (which is neighboring on the other side of our town so not really close) to trick-or-treat here. Of the 100+ pieces of candy I gave out today I literally recognized four or five families from our neighborhood. And if you are going to come to another neighborhood to trick-or-treat at least wear a costume! Also I don't understand the adults who carry their own trick-or-treat bag and ask for candy. We had several of these. There was a bag for each child and one for the adult (who most often is not dressed up). Hmmm...you are an adult, go to the store and buy your own. So our dear sweet Fluffy managed to get out tonight and was out for about 15-20 minutes. I was frantic since I couldn't really look and watch Hazel. I called my good friend and neighbor and she walked back since her husband and sister were with the kids as well, but since she was walking (she lives 1/2 mile away) it was taking too long and I freaked when I saw Fluffy heading towards the corner and street, so I called our neighbor across the street. They got here at about the same time and one stayed with Hazel and one went to help me look at which point Fluffy decided to come home on her own. Oh, and did I mention Hazel did not nap today since she was so excited about Halloween. We went to the story time at the library and Steve took her out to play this afternoon. Apparently they built a snow fort--I'm not sure how since we really didn't have that much snow, but that is what they told me. Hazel has been wanting to play in the snow. She keeps asking to build a snowman and I keep telling her we have to wait for more snow. Then I took Hazel trick-or-treating while it was still light out. We went to the few neighbors we know. Besides candy Hazel got a backpack from our new neighbors. Their nine-year-old is wonderful with her. Hazel keeps wanting to invite her over to play. Then we came back to have dinner and give out candy. I realized pretty quickly that she wasn't going to go down until the trick-or-treaters stopped. I turned the light off at 7:45 and got her asleep by 8. Not too horrible all things considered. Now I have to do my pumpkin fairy duties. We put all the candy she was willing to part with in a bag in the hallway. 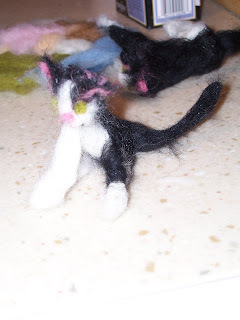 I have been saving a few needle felted projects for her. 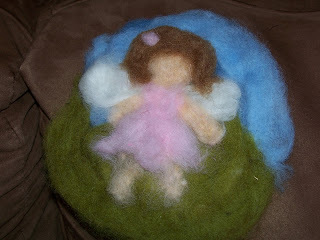 One is a cat that looks somewhat like Fluffy and the other I made last night, my first attempt at a flat needle felted picture of a fairy. For the fairy I was inspired by this post at Softearth's World. The cat I followed somewhat the directions in Little Felted Animals by Marie-Noelle Horvath. I changed the colors to match Fluffy. The cat is not perfect, but I made two attempts and decided it was good enough. My plan had been to make a wet felted jack-o'-lantern following the tutorial on Woolpets. However, I never got around to getting the balloon, so it didn't happen. Maybe next year. Well now that Halloween is over I am going to look forward to the next major holiday. For me it is Thanksgiving. I wanted to create a countdown of sorts for Hazel, but wanted it to have more meaning. 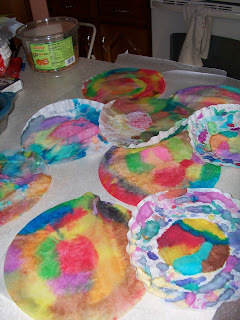 My idea is to make the coffee filter leaves from Frugal Family Fun Blog. One for each of the 24 days until Thanksgiving. So today we painted 12 coffee filters and by we I mean Steve, Hazel and me. This is going to be a family affair, so I wanted to start it as a family. I'm going to cut out the leaves from them. Then I'm going to put a clear sticker with I'm thankful for typed on it and each day we will fill it in naming things each of us is thankful for. I'm hoping this will teach Hazel a bit about Thanksgiving and being thankful. Then we are either going to make a leaf garland adding each one each day or I may use the idea of the tree out of brown craft paper to have specific places for each leave to go so it is more of a countdown. For the labels you can download them here. I used clear Avery labels 5160 for the formatting. I will add more pictures of the leaves when we cut them out and write on them tomorrow. Now, I'm going to relax and get the stress out of my body from my crisis tonight. I hope everyone had a safe and warm Halloween! Sounds like a stressful evening!! Hope things settle down for you! Thanks, Lorie! They have. Today is a new day and a new month!